Aliso Niguel HS and Blues Coach Randy Dodge was honored over the weekend as the 2012 National Soccer Coaches Association of America Division I HS Coach of the Year. Randy was the Register’s and the CIF-SS Division I 2011-2012 Coach of the Year; he led the Wolverines to a 23-1-4 overall record that included a 19-match unbeaten streak and 15 shutouts. Aliso Niguel went on to capture the school’s second CIF-SS Division I championship and its’ first ever CIF Southern California Division I Regional championship. The Wolverines were honored by MaxPreps and ESPN as each publication's girls’ soccer national champions. Randy received the award at the annual NSCAA Convention in Indianapolis, Indiana. “It was a fantastic honor,” he said. “It took a lot of hard work and we have some fantastic kids in the program. I’ve also had the support of a great administration at Aliso Niguel”. The NSCAA Coach of the Year award recognizes coaches in the NCAA, NAIA, NCCAA, junior colleges, and high school. Randy was the only high school coach from California to be honored among both girls and boys award winners. My summer began with a missionary trip to Kisumu, Kenya. I spent a week serving at Agape Children's Ministry, a boarding school and home for boys who were formerly living on the streets in Africa. My grandparents' are the directors of this ministry. We helped my grandpa build a new wall, we joined the boys for lunch and, after their school day ended, we played and did lots of fun crafts with them. But, my favorite activity was when my cousin, Lucy, and I got to join the Agape soccer team during their practice. We did drills and foot work training, just like I do with my So Cal Blues team, and played a scrimmage at the end (skins vs. shirts) We were the only two players in shoes. 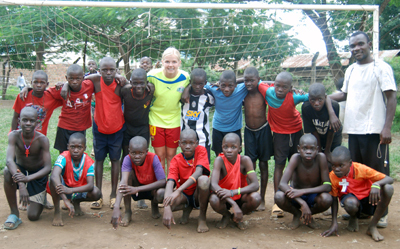 Soccer was the activity that bridged the gap between me, a 13 year old, blonde girl from Southern California, and young African boys with heartbreaking backgrounds, who once called the streets of the third largest city in Kenya their home. When I told the boys that I play soccer (or"football" as they call it) and could juggle a soccer ball, they didn't believe me. So, I showed them that I could juggle and that earned me their respect. They couldn't believe that a mazungu (Swahili word for "white person") could play soccer. This happened almost everywhere I went. It even happened on the outskirts of a little village, on the side of the road, when our car broke down. There were kids all around us and some of them were juggling an old soccer ball. When I asked if I could juggle their ball, they laughed in such a way that I knew they didn't believe I could do it. You should have seen their eyes when I proved them wrong. We then had a juggling competition. I didn't come close to breaking my record (juggling in a long skirt is challenging), but I won! It was an amazing experience to play soccer with the boys at Agape, and to serve alongside my grandparents in a third world country. It is a trip I will never forget, and I look forward to going back some day and playing soccer with the Agape boys again. Did you happen to get a look at the Blues U14 Draluck at the Eclipse Tournament? If so you might have noticed that the team had a new look at the tournament. 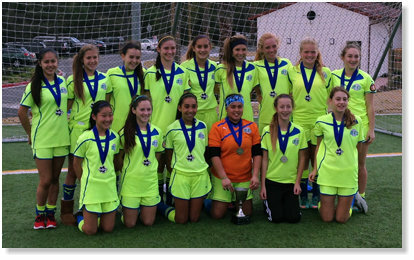 Thanks to a seamless collaboration between the South Bay Force Club, who have one of the most competitive teams in the age group, our U14 Blues were able to come away with the tournament championship defeating West Coast 1-0 on a late Samantha Hobert blast from close range. 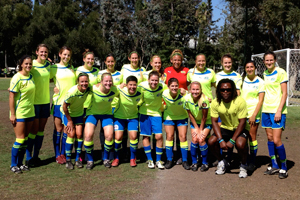 The SB Force loaned six of their players to the Blues who all contributed mightily to the success of the team along with SD Surf Goalkeeper Isa Hernandez . Force attacker Brooke Redington bailed the team out in the semifinals with two goals in a come from behind 2-1 win over the Eagles. Force fullbacks Karina Rodriguez (Anika's Sister) and Erin Kawakami teaming up with Blues fullbacks Dani Satterwhite, Maddie Tarin, and Bernadette Haponski, locked up the goal conceding only one during the entire tournament. The infamous Saldana twins gave depth to the midfield along with Force attacker Ashley "Peanut" Humphrey. Blues players AK Ward, Amanda Jones, Olivia Lacasto, and Ashley Sanchez were also instrumental to the team effort. Congratulations "South Bay" Blues...Let's Do It Again Soon!!! 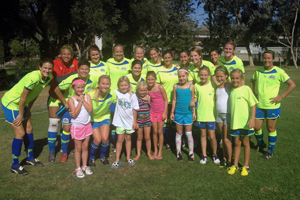 Our Club sent seven teams to compete at this Summer's SD Surf Cup Tournament. Out of the seven teams (U11-U17) representing the club all seven qualified for the semifinals which took place on the third and last day of the tournament. Five of the seven (U11, U12, U13, U14, U17) won their semifinal match and played in the championship game. Out of the five finalists unfortunately only two of the five (U12, U13) came away with the tournament championship. Nevertheless the overall tournament results for the club were something to write about. Congratulations to our teams. The U10 Mulligan team participated in the Pyramid Cup the weekend of July 28th and July 29th. The tournament was put on by Beach FC in the city of Long Beach. The U10 Mulligan team won all three games in pool play. The team defeated two Beach teams and Real So Cal to advance to the finals. In the finals, the U10 Mulligan team defeated Cypress FC in over time (3-2) to win the tournament. Great job girls! This past Sunday my family participated in the Katie Hawley run in San Clemente. My mom, brother, and I went down around 7:20 am. When we first arrived, I couldn't believe how many supporters were there. I saw moms, dads, grandmas, grandpas, and even girls I played against all ready to run. There were boys and girls of all ages that know her from soccer, volleyball, school, or know her story. Many of them have been there from the beginning of Katie's climb and will stay there until the end. They kept her story alive. When I saw Katie I ran up to her and gave her a big hug and told her how happy I was for her and her family. My mom ran up to MK and Bob and did the same thing! Before the run, Katie and her family thanked everyone for supporting her and said how grateful they were to be with their daughter today. The run began and I saw Mary Namie my former U9/U10 coach, some of my teammates, and soccer friends who had volunteered their time to help with the run. I also saw my coach Tad, and Julie Foudy. The best part of the run was watching Katie cross the finish line. It wasn't a finish line for the run, it was the finish line of her cancer and how hard she has fought to stay alive. I am so glad I got to see Katie and her family and it was truly a memorable moment. Katie will always have to fight, however, she's fighting with many many other people behind her. The Women's Blues have returned to San Juan Capistrano signed up and ready to play in the new Women's Coast Soccer League (CSL). The Women's Adult Blues are currently first in standings with 18 goals for and 0 goals against. The team is packed with Blues Alumni from all eras. The love of the game and renewed friendships have brought these girls back together, not to mention the opportunity to give back to the Blues as positive role models for our younger players. The girls are proud and excited to represents an organization that helped to change their lives for the better. The team's goal is to "climb to the top of the mountain". Special thanks go out to Dido for believing in this concept and to Blues Alumni and now Blues youth coach Lauren Leslie (Fly) for helping to put the team together. GUATEMALA CITY - The United States won its second CONCACAF Under-17 Women's Championship crown Saturday, riding Amber Munerlyn's first-half goal past Canada 1-0 and avenging its semifinal upset of two years ago. 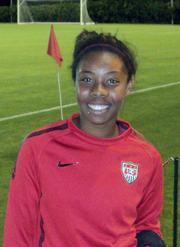 The Americans outscored their opponents 26-0 in five games over 10 days and earned some measure of revenge against Canada, which held the United States to 0-0 draw in the knockout round in 2010 and then prevailed on penalties to make it the only U.S. women's team to fail to qualify for a World Cup. The United States had the better of play for most of the first half, while Canada controlled the ball for more of the second half, especially the final 10 minutes. However, besides Munerlyn's goal, only sporadic chances tested either goalkeeper. The best opportunity outside the goal came in the 34th minute when Munerlyn volleyed Summer Green's cross off the right post. The Americans had the better of the very early play and went ahead in the 21st minute when Maddy Bauer drove a ball from within her own defensive third to Green, standing on the edge of the edge of the center circle in the Canadian half. Green used a deft back heel to send Munerlyn down the middle of the Canadian defense, where she outran Rebecca Pongetti and fought off the shoulder challenge of Lindsey Agnew before dribbling into the penalty area and chipping a soft shot over goalkeeper Kailen Sheridan from the penalty spot. The Southern California Blues Soccer Club, out of San Juan Capistrano and coached by Larry Draluck, won the PUMA's vElite bracket at USA Cup in Blaine, Minnesota. As Champions, the team not only claimed the winner’s trophy they also won an all expense paid trip to Umea, Sweden to train with Umea IK international team and learn from the professionals. The 2012 Schwan’s USA CUP is a youth soccer tournament with 958 teams, representing 16 countries and 22 states. It is the largest youth soccer tournament in the Western Hemisphere. 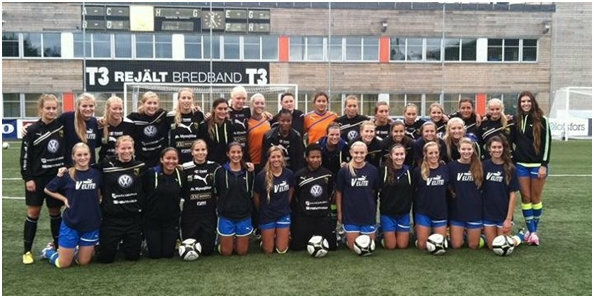 As a PUMA club, the SC Blues had the opportunity to go behind the scenes with Umea IK to train in their world-class facility and meet their A-team players. They also had a friendly game against the Umea U-17 team in which they played to a draw 1-1. The SC Blues had the opportunity to get off the soccer pitch and enjoying river rafting, play competitive laser tag and bowl a few games of Cosmic Bowling. The Swedish hospitality was unsurpassed and the beauty of the countryside was a site to be seen. The SC Blues players were: Kelsea Arenado, Nikki Faris, Kassidy Gorman, Randy Holman-Kelley, Alison Jahansouz, Kaitlin Klawunder, Taylor Klawunder, Karli Ladwig, Alexis Leon, Stephanie Malherbe, Niki Miyashiro, Jenna Reeves, McKenna Roth, Carina Thomas, Erica Wadell, Rachel Witz, Taylor Wulf. This was a once in a lifetime opportunity that they will never forget. SoCal Blues’ Draluck changed coaching ways. Southern California Blues SC program director Larry Draluck has evolved as a coach. Draluck, a nationally licensed U.S. Soccer Federation coach who helped start the South Pasadena High School girls’ soccer team in 1984 and SoCal Blues in 1990 (with the origins of the club dating back to 1985), used to be more traditional in his coaching methods, and got caught up in the competitive atmosphere of youth soccer. In an exclusive interview with The Soccer Wire earlier this month, Draluck said he used to have trouble getting through to his players, until he learned they were lacking something that he wasn’t providing them. Under the influence of fellow Blues program director Tad Bobak, Draluck started to reevaluate his coaching methodology. Bobak told Draluck his players didn’t have the ability to feint and fake. That summer, Draluck worked on having individuals hold possession of the ball – through dribbling and faking. Through a relationship facilitated by Blues equipment supplier PUMA and their TCC Program, Draluck was able to work with the coaching staff of Mexican heavyweights Pumas UNAM, whose coaches influenced Draluck on their emphasis at the professional level on a player's basic ability to receive the ball, giving them the time to make their own choices versus having the ball force them into poorer decisions. As a goalkeeper, Draluck played with Martin Vasquez – currently a U.S. Men’s National Team assistant coach under Jurgen Klinsmann – in college at Cal State Los Angeles on a team that went to the Division II national championship game in 1981 and held the no. 1 ranking during the season, falling 1-0 in the national championship game to Tampa. Draluck was later named Cal State L.A.’s Men’s coach after being an assistant for four years while coaching at South Pasadena. He played in Mexico for about 18 months with Universidad Autonoma de Guadalajara, better known as Tecos, then returned to California and finished his degree in physical education at Cal State L.A. after the club sold his player card to San Luis Potosi. At the time, Draluck wasn’t focused on coaching girls’ soccer, but started up the South Pasadena High School girls’ soccer program in 1984. 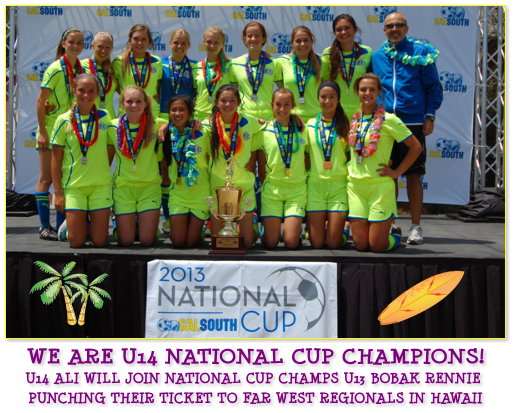 Soon after his formation of the So Cal Blues, Bobak arrived from UC Santa Barbara. “There’s nothing better than helping the kids,” Draluck said. He said he has changed as a coach. For Halloween, Scooter Hussey went Trick or Treating for the American Red Cross to raise money for the victims of Sandy. She raised $75. On November 1st we went to the Honda Center when ABC Eyewitness News and Garth Kempt were collecting funds. Scooter ended up being interviewed by Garth on the 4 PM news and ended up on the 11 PM news in her SC Blues sweatshirt. At one point Garth said “I like your sweatshirt.” To which Scooter replied “Soccer.” Garth got this big smile on his face.